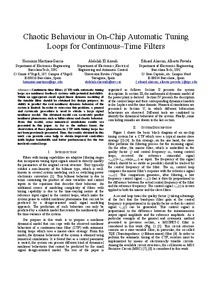 Martinez, H.; El Aroudi, A.; Alarcon, E.; Poveda, A.
Continuous-time filters (CTF) with automatic tuning loops are nonlinear feedback systems with potential instability. While an appropriate small signal linear dynamic modeling of the tunable filter should be obtained for design purpose, its ability to predict the real nonlinear dynamic behavior of the system is limited. In order to overcome this problem, a general and systematic procedure is used to obtain a large signal nonlinear model. The obtained model can accurately predict nonlinear phenomena such as bifurcations and chaotic behavior. From this model, some numerical simulations results are presented in this paper. As far as the authors know, the observation of these phenomena in CTF with tuning loops has not been previously presented. Thus, the results obtained in this work can provide some help to obtain improved controllers (with higher bandwidth and better performance) for the two involved control loops. Martinez, H. [et al.]. Chaotic behaviour in on-chip automatic tuning loops for continuous-time filters. A: Seminario Anual de Automática, Electrónica Industrial e Instrumentación. "Actas del SAAEI 2013 - Actas del Seminario Anual de Automática, Electrónica Industrial e Instrumentación 2013". Madrid: Universidad Politécnica de Madrid (UPM), 2013, p. 1-4.